The Emerald Isle, long known for its lush, green rolling hills and valleys, its melancholic love ballads and its population’s genuine love of all that is life, conceals a few other gems within its balmy shores. No, these are not the mythical, magical leprechauns you may think I’ve overlooked, or the saintly swans that swim majestically in its lakes and ponds, but wonderful oases of organic goodness nestled throughout the city of Dublin and its northern suburbs. The magnificent Organic Markets! 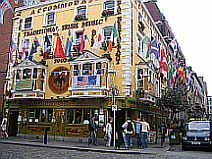 We begin our journey in Temple Bar located in the heart of Dublin City Center. Long known for it’s never ending night life, array of multi-ethnic restaurants (everything from Mexican to Moroccan) and svelte shops, Temple Bar is home to one of Dublin's most charming outdoor organic markets every Saturday from 10am. - 5pm. Though compact and a bit pricy, the market in Meeting House Square accommodates a capacious variety of products ranging from the organic fresh fruits and vegetables of McNally Family Farms to the sumptuous, handmade, all-natural chocolates of Chez Emily. If you haven’t had breakfast, (and even if you have! ), indulge in a freshly made waffle and wash it down with a tasty fresh fruit juice from Going Bananas. There are crepes, free trade coffee, sweet pastries, smoked fish, a literal smorgasbord of gourmet delights to tantalize the senses. The electric, absorbing atmosphere unique to organic markets is tastefully enhanced by the “crème de la crème” of Dublin’s gifted buskers and it’s very easy to find, with entrances on Eustace St., Sycamore St., and Essex St, and once there, you’re taken back in time, or at least transported to another world. Though Dublin itself is indeed another world! But the Dublin organic experience need not be limited to the City Center. A 20 minute DART ride (Dublin Area Rapid Transport – Dublin’s train service) will whisk you away to the beautiful coastal towns of Howth and Malahide which feature their own organic markets. 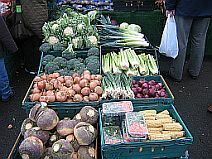 Malahide’s market takes place on Saturdays from 10am till 3pm on Church St. behind the Art Center. A wonderful array of organic goodies is laid out in a very intimate and fun setting making this one of my favorite organic markets in Dublin. Free samples of delicious fruits are happily and boisterously offered by vendors from the north, and the selection of produce is remarkable considering the compact schema, ranging from delicious all-organic breads to fish, fruit, vegetables, jams and other tasty treats! Malahide itself is very upscale, so prices tend to be a bit high, but not extraordinarily so, and its well worth a walk-around, especially in the Malahide Castle grounds and the Marina and Strand areas. There are also plenty of fine restaurants, many of which serve top-notch organic and vegetarian foods supplied by all the local organic markets, so make a day of it and enjoy Ireland in all of it’s splendor! Howth is a bustling little fishing village where the market comes alive on Sundays. Quite a bit bigger than the organic markets at Temple Bar and Malahide, the Howth market features everything from the usual organic fare to jewelry, clothing, wines, knick knacks, books (some days 3 for a euro! ), a German sausage stand, crepes, coffees, and Italian and Caribbean stalls where you can buy delicious condiments and such. 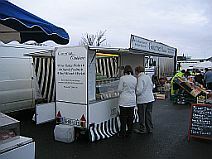 The Howth Market is also home to Gourmet Cuisines, at whose stall you'll find delicious organic and freerange meats; lamb, poultry, beef, and pork. There are also several fish mongers in the immediate area that sell fresh seafood; fish, shellfish and all the trimmings. You can even purchase a bottle of fine wine to go with your meal, or an excellent pasta sauce, or pehaps some fresh mackerel to feed to the seals! Fresh bread is also plentiful in the market area and the variety is out of this world! At one stand you can purchase three good sized loaves for only €6. There are some first class restaurants also in Howth and plenty of opportunity to stretch your legs and enjoy some scenic walking. Take the cliff walk around Howth Head or stroll up to the Martello Tower, easily visible from the market area, which houses an interesting Museum of the History of Radio and offers a spectacular view of Howth Village and harbor. We visit organic markets regularly, so make sure you subscribe to our RSS to recieve immediate updates whenever we add more organic markets, material or new pages to our website.